DENVER — On World Autism Awareness Day, Governor Jared Polis signed a bill that expands medical marijuana use. Advocates have been fighting for two years to add autism to a list of qualifying medical conditions in Colorado. 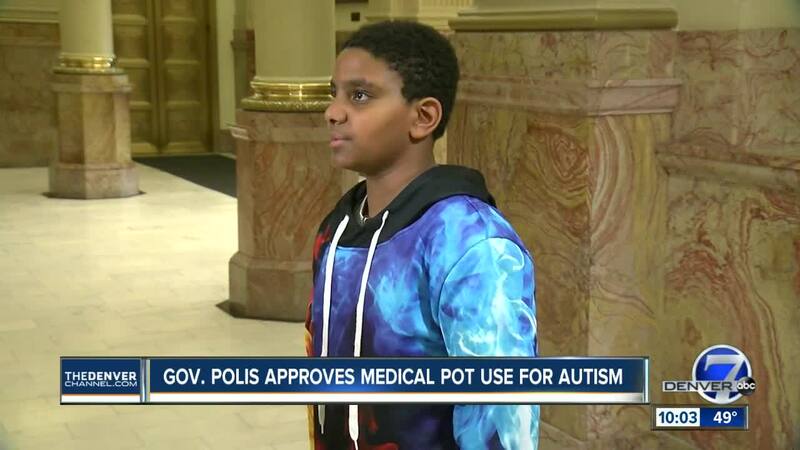 “I definitely believe it’s going to help kids for many reasons," said Michelle Walker, a parent of an autistic child who has other conditions that qualified him for medical marijuana. "One of the biggest reasons is I’ve seen it. I’ve seen my son’s life change. I’ve seen our family’s life change. It’s done a 180, and we’re not the only ones." Walker and her family moved to Colorado for the sole reason of obtaining medical marijuana for her son. He was able to start using medical marijuana to treat his seizures but said she also noticed a difference in his overall behavior. "So I know it is an option for others and that it can be a beneficial option," said Walker. Walker and other families were at the Colorado State Capitol last year when a similar bill was vetoed. Former Governor John Hickenlooper did not sign off on the bill because he said more research was needed. "It was heartbreaking," she said. "I cried and my son has access but to look in these families eyes after they had fought so hard, it was crushing." Those parents cried happy tears when Governor Polis signed the bill on Tuesday. Jackie Bess brought her son Jackson to the governor's office to take part in the celebration. She hopes the move will help normalize the use of medical marijuana for autism ensuring parents will be able to talk about it with their child's doctor. "Right now doctors won’t talk to us about it," said Bess. "Definitely, it will help other families." Bess and Walker agree that medical marijuana might not be the right solution for all kids with autism, but they believe families should have the option to try it. "We’re not saying medical marijuana for anyone, anything," said Bess. "We’re saying autism is special and it requires some more tools in our toolbox,"